Sofia’s National Palace of Culture was the venue where scores of Bulgarian children had the opportunity to enjoy Disney Live’s show and celebrate “The Birthday of Winnie-the-Pooh" past Saturday. The transporting of the sets to Bulgaria was a mammoth task involving 8 trucks; thereafter fifty people were required for constructing the entire set. 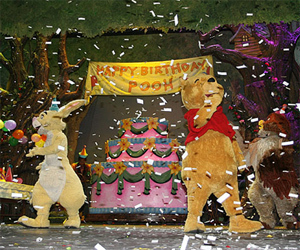 Large quantities of leaves and trees plus mobile sets were also put in place to resurrect a 100 acre wood where Roo, Kanga, Piglet, Eeyore, Rabbit, Owl and Tigger, the characters created by Milne put on a splendid performance for the audience. Storytellers and clowns added opulence to the overall performance. The audience too got involved in the show as they sung along side Roo and also went jumping with Tigger. This show has been performing for the past twenty five years now and Bulgaria is the latest destination for the world tour of this show.